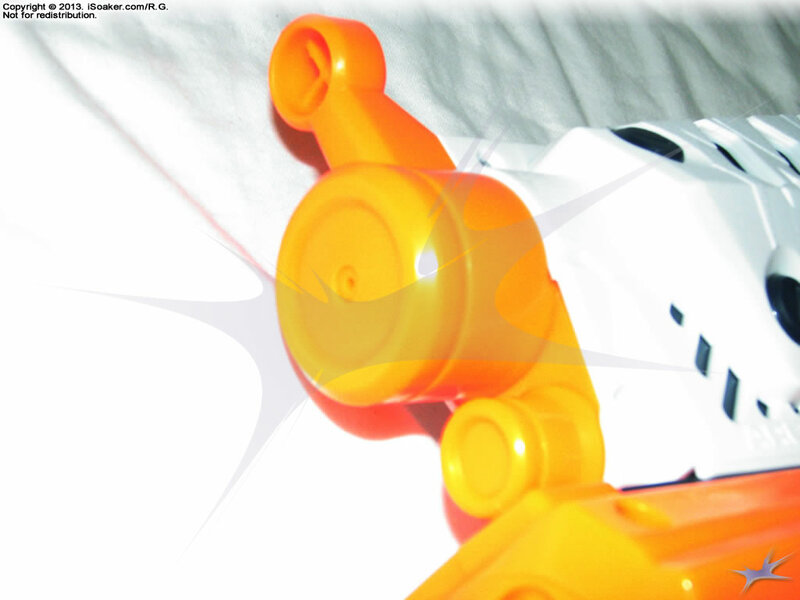 The Nerf Super Soaker Arctic Shock is a new model for the 2013 Nerf Super Soaker line. 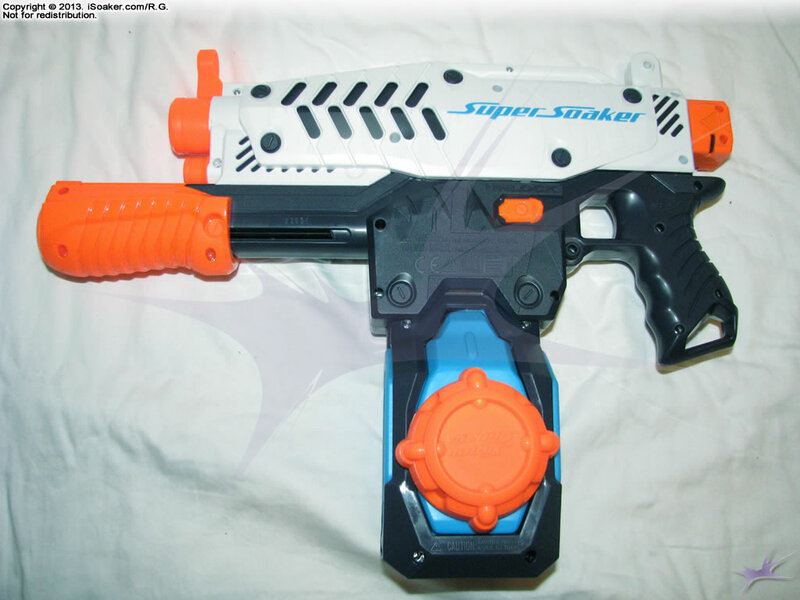 It is the middle-sized water blaster in the 2013 line, being pump-action and featuring a larger opening on its magazine-based reservoir so that one can more easily put in ice cubes if one wishes. This water blaster should not be confused with the Super Soaker Arctic Shock (2005) which was an air-pressure-based water blaster. The Nerf Super Soaker Arctic Shot features a single, small nozzle. Streams produced by the nozzle are fairly smooth, but being pump-based, the amount of water pushed is completely dependant on pump volume which, unfortunately, is not that large (even less water per stroke than the Nerf Super Soaker Scatter Blast). Being pump-action, the range achieved is decent, reaching up to ~10.5m (~35'). Each shot, of course, is rather short in duration and pump lag inhibits one from being able to rapidly shoot as is explained below. The Nerf Super Soaker Arctic Shock features a semi-tracked pump. The pump grip area is chunky and feels quite comfortable to hold; its vertical ridges offer good traction when pumping. Pulling the pump to create a stream works well, but the pump intake appears to suffer from some lag, even when drawing water from the reservoir supplied; the lag effect is slightly worsened if the blaster is attached to the Nerf Super Soaker X-Treme Hydro Pack. This makes the blaster stutter if one tries to pump rapidly. It is unclear whether this is a result from tight directional valves or the additional tubing required by the use of the magazine system, or both. On top of this, the amount of water pushed per pump leaves much to be desired; the older Super Soaker Aquashock Sneak Attack pushed out almost three times the volume of water that this Arctic Shock can. These faults with the pumping mechanism serious detract from this blaster's usefulness in the field. It should also be noted that while output is calculated to be ~33mL/sec (~1.1 oz./sec), due to the short firing time and the prolonged pump refilling time, the average/practical output of the Nerf Super Soaker Arctic Shock is probably closer to its pump volume per second which would be ~13mL/sec (~0.4 oz./sec). 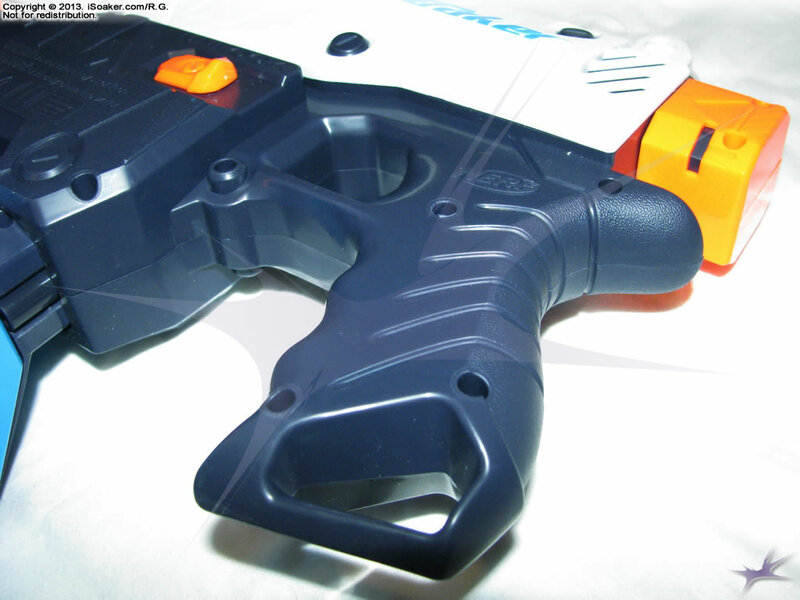 The trigger and grip area on the Nerf Super Soaker Arctic Shock, like the rest of the blaster, are well moulded and quite comfortable to hold. Again, Hasbro Inc. spent a good amount of time refining their triggers and grips. The grip is also nicely in line with the pump allowing one to put one's full force into the pump. The reservoir on the Nerf Super Soaker Arctic Shock is really what gives this blaster its name. 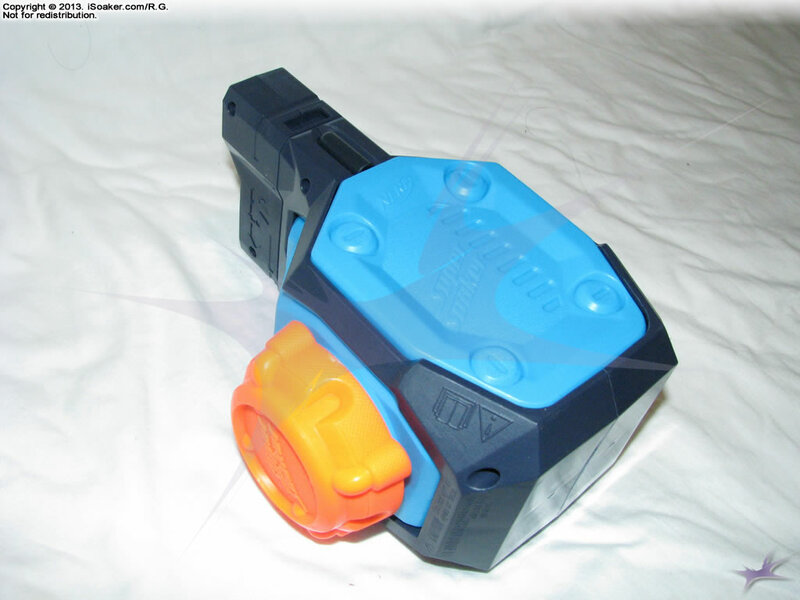 Using the same magazine/clip system introduced in 2011 with the Nerf Super Soaker Thunderstorm and Tornado Strike, is box-like shape allows it to hold roughly three times as much water as the original magazines, but less that the drum that came with the Nerf Super Soaker Lightningstorm. As noted above, this reservoir features a larger cap to make it easier to put ice cubes into it to chill the water; the other benefit is that the larger opening also makes standard refilling easier. One can, of course, swap in the magazine from the Nerf Super Soaker Thunderstorm, the drum from the Nerf Super Soaker Lightningstorm, or attach the larger Nerf Super Soaker X-Treme Hydro Pack if desired. As a whole, the Nerf Super Soaker Arctic Shock is a solidly built blaster with nice styling, but lacking on available power. Its single nozzle functions ok, but lacks power due to the limit imposed on it due to this blaster's rather low pump volume. The ability to add in ice cubes more easily may appeal to some, but does not improve this blaster's performance and the novelty of using ice-chilled water tends to wear out fairly quickly in typical water warfare games. The Nerf Super Soaker Arctic Shock performs best in smaller skirmishes or as a back-up paired with a larger, pressurized water blaster. Due to the pump's flakiness when attempting to pump more rapidly, the Nerf Super Soaker Arctic Shock is not really recommended as a primary for any larger engagements. Nice styling, sturdy build. Larger cap makes the reservoir easier to refill and one to put in ice cubes if desired. Decent amount of water available in its reservoir for a blaster its size. Very limited pump volume means limited soaking capabilities. Pump suffers from refilling lag making rapid blasting not possible. I got the Arctic Shock for the "Ice Tank" as it were. The gun itself is a sturdy piston action water gun with decent range. It shares compatiblity with the Nerf "stock" parts, allowing you to give the gun better balance, if desired. It also has a place for a clip, which is useful. It's been noted that people have an issue with the gun jamming. Upon closer inspection, I noticed that on mine, the locking mechanism was misaligned. Rather than opening the gun up to see if I could realign it, I simply cut away some of the excess locking cog, then sanded it down. The gun does not jam now. I hope this helps people with similer issues.